I have to say I love the Perhapanauts. Especially Choopie. He’s endearing, in a creepy kind of way. I’ve no tales of Chupacabra, but if you are interested in a good old fashioned ghost story I believe I’ve got one. It was the fall of 90 and the spring of 91. It was my first year away at college. I was living on the 10th floor of Indian Tower. Rumor had it that years ago a girl who lived in my room, on my side of the room, had died suddenly. No details were given, but the fact of her death was confirmed by the floor RA. The room was rectangular. My bed was on the short wall with my desk, my roommate’s dresser and her desk on the long wall. The only window was above the head of my roommate’s bed which rested lengthwise on the other short wall. A double closet, my dresser and the door were the last wall. Little things, strange things started happening. The lights would be on when I came home. The chair would be pushed away from the desk. Items on the desk were moved from one side to the other. At first I thought my roommate was absent minded. Then it occurred to me that only my desk was rearranged and only my lamp was on. Why would she be using my desk and my lamp? She insisted otherwise. When the lamp began turning on in the middle of the night, we were both concerned. I started unplugging it before bed, it made no difference. Two or three times a week we would wake up blinded by the light. For the next four months my roommate slept with a pillow over her head. Then it was the radio, my radio. Did I leave it on? Maybe. But not every Thursday in the months of November and December and definitely not on the 60s station. Again I accused my roommate of playing tricks. She laughed saying she would have picked a better station. Then pointed out that on Thursdays she left before me and did not return until after soccer practice, long after my last class. In February I displayed Valentines on top of my dresser. From an admirer I received one of those jumbo cards, at least two feet tall. This one I placed in the back as not to block the view of the other cards. I can’t count the number of times I found that card and that card alone on the floor. Some would say it was the wind. But anyone who has ever lived in Albany, in February, knows it is much too cold to have the windows open. I experimented with opening the door quickly and slamming it shut. My best attempt at creating wind managed to knock down the little cards, but the big one never budged. The following Saturday I came home early from a party two floors up. When I say early I mean I was among the first to leave. It was about 1am. I’ll admit to having a little buzz, but mostly I was just tired. I was lying in bed just about to drift off to sleep, when I got an overwhelming sensation that I was not alone. But I was alone. My roommate had gone home for the weekend, some family event. So I opened my eyes and glanced around the room which was dimly lit by a full moon. I saw a shadow by my dresser and then the giant Valentine lifted up. It rose slowly, almost cautiously. The card hovered above the dresser until it cleared all the other items. Then as if it had been thrown, the card crashed to the floor & skidded under the bed. At that moment I was very awake and frankly a little annoyed. I had been picking up that card every day, several times a day, for at least a week. I remember speaking out loud. “I understand that you were here first, but I was assigned to this room. And I don’t mind if you want to share this space, but I’d appreciate if you stopped touching my stuff. If you hate the card so much, I’d be happy to put it away.” I picked the card off the floor, placed it in the closet and went back to bed. When I woke in the morning, the card was displayed prominently on my dresser. The last incident occurred in late May. My roommate & I were both studying for finals. Each of us sat on our beds buried in books & notebooks. Besides the rustling of pages turning the room was still. Suddenly the chair at my desk began rocking. The base was made of aluminum and shaped like a three sided square. It made loud clanking sounds as it moved against the cement floor pushing away from the desk. Then the door creaked as it opened a little wider. My roommate meekly asked if I had kicked the chair. From her view point it was clear that no matter how I stretched my feet could not reach. After a long moment of silence I said “maybe she went to get a drink or to use the restroom”. Two days later my tests were over & I went home. I attended that school for another year & a half, living with the same girls, but in a different dorm. Nothing weird ever happened again. Hope you enjoyed my tale! thanks so much sharon, great story!! if you haven't already, rush right over to www.mikewieringo.com and check out mike's blog section for the mad love he gives to his boyz, not to mention the truly stunning (no, really--you'll be stunned! mesmerized! deer-in-the-headlights stupid!) sketch he posted of everybody's favorite perhapanauts! well, if you haven't been checking out mike's website as part of your daily/weekly routine, now you have an idea of whatcha been missin'. several times a week mike posts samples of his really wonderful artwork along with some recommendations, insights, and praise for various comics and creators both in and out of the current mainstream. in both his drawings and his words, mike's passion for the art and the language of comics comes through in every line. and if by chance you don't know who mike wieringo IS, well, friend, we need to get you out from under that rock you've been livin' under for the past 10 years or so. mike is, as we constantly tease him about, one of the "premiere artists working in comics today." his lush and "bouncy" figure-work, his inspired design, and fluid storytelling have infused a new life into the pages of books like the flash, robin, superman, the fantastic four, and currently on the new spider-man title, friendly neighborhood. i once heard mark waid refer to mike as "the nicest guy in comics", and though i'm pretty sure i also heard mark say that about one or two other guys (sorry, mark--it's true...although i think one of those times was at the gorilla party so you're kinda off the hook), i'd have to say that fits mike to a 't'. more than anything though, mike is my friend--one of my very closest, my brother. as i said over on his blog, our work together on spider-man and tellos aren't just highlights of my career, but of my life. and i consider myself very, very lucky to both work with and know him. oh, and this isn't just my blog. craig likes mike too! actually, the three of us are pretty tight friends and if you see us hanging out at a convention together, we're probably laughing. and probably at you. 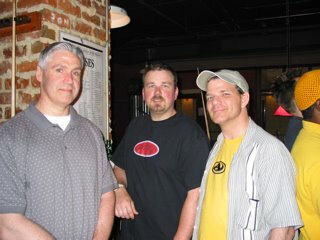 mike, craig, and me, like 4 years ago. special guest blogger today is our good pal kojee, late of the old tellos message boards and valiant champion of the perhapanauts. and a really nice guy! in my attempt to badger readers into sharing their tales of the weird and wonderful, jared is the first one i managed to force a story out of. he was a little shy at first, but, man, read what he gave us below! thanks for the story, kojee. i love this stuff! that someone had broken in, robbed, and trashed the place. someone found a way to get in and just played a prank. tampered with. There were no signs of a brake-in anywhere. walk the dirt roads and murmur meaningless phrases. then continued his walk down the road. My Dad was shocked. not, it makes a pretty fun story! thanks again, kojee! for being a pal and for being the first! and read the perhapanauts! it's good for you! crypto-revelations: part III--"what goes around..."
cut to a few years later. though late to it (i'm technologically retarded) i am finally hooked up to the internet and using it to it's full advantage; mostly looking for stupid stuff and old comics on ebay and doing searches for all manner of cryptid/paranormal/extra-dimensional info. i'm being bombarded with tales of the unknown, stories of strange creatures, and reports of some really weird stuff. every two weeks or so, i jump onto ebay and type in my regulars--chupacabra(s), mothman, loch ness monster, jersey devil. i skip bigfoot because it's just too huge an entry, but i will search sasquatch every now and then to mix it up. at one point, fairly recently, someone was auctioning off a chupacabra embryo, really cool looking special effects prop. i woulda bid if it hadn't gone for, like, a ka-billion dollars. anyway, very early on in this game, i found that there was a company in hong kong or china that put out several series of small (3 to 4 inches tall) plastic figures of all our favorite cryptozoological pals as well as a couple of unexplained artifacts! bigfoot! mothman! the flatwoods creature! and, dude...a chupacabra! it looked so cool, so vicious, so alien! man, i gotta get the chupacabra! i gotta! and i won! i got it for like $3.00--shipping included! man, i could not WAIT for it to get here! so it shows up in the mail one afternoon and i'm not only thrilled about how cool it looks on my desk, but that inside there's a brief history of the chupacabra (in chinese so i have no idea what the #^@% it says...) and a reproduction of the original eyewitness sketch of the chupacabra by jorge martin during the '95 flap in puerto rico. awesome! ...there on the side of the box is a picture of exactly the thing i saw float over my jeep on that february night 4 years before. it's called a skyfish and that's not the cool part. so i go online and immediately start my search for the skyfish. it's a bit of a disappointment at first 'cause if you check it (and maybe you will) it seems that, in the past three or four years, 'skyfish' has also been commandeered as the name for another bizarre phenomena down in the jungles of brazil; small, darting, not-as-cool-as-the-thing-i-saw, little insects being caught on film but, because of their incredible speed, invisible to the naked eye. big deal. dude, mine was, like, 12 feet long! anyway, desperate to find a connection to what i saw, i continued to search throughout the listings for the skyfish and finally found reference to something a little bit bigger than a few inches. skyfish: first reported and named sometime in the late seventies. list of some names and dates of folks who've purportedly seen it. but--here's the cool part--last reports of skyfish sightings: 17 sightings in the mid-hudson valley in the winter/spring of 1995 between the towns of staatsburg and pawling. there is no cooler thing than getting confirmation, even on such a tenuous level, about something that most people you tell are skeptical about. i don't need anyone to believe me. i know what i saw. but it's cool just the same. if you've got a story of the bizarre or the strange, the scary--or even funny--thing that happened to you, send it in! she said that it had been some 4 or 5 years before, that she was driving home from a long weekend conference or something on some windy back roads in wisconsin. it was very late and she was a bit miffed because her then boyfriend, a quasi-loser named chuck, had said that he'd drive back but was now passed out in the passenger seat and she, exhausted herself, had been left with the driving chores. she made it a point to repeat; she was very tired. she said that she was focussed on nothing but the headlights on the road, when she spotted a pale shape at the side of the highway ahead. as she came closer the shape began to cross the road in front of her and she slowed down, trying to make out what it actually was. she said that as she got closer, her mind was trying hard to identify what she was seeing, to make some kind of sense of it, but it just wasn't coming together. it was short, maybe 2 and a half to 3 feet tall, and it looked like a cross between a chicken and a monkey--chicken legs and a monkey's upper body. she said that, as the creature was caught in her headlights, it turned to look at the slowing car, and that, where most animals have a look in their eyes of fear or disorientation when confronted by a vehicle, this creature's eyes conveyed a different message, a sentience and a knowledge that it had been caught and that it was not supposed to be seen. she said that she had brought the car almost to a complete stop, just inching along slowly by the time the creature turned away and bounded off into the darkness. barb continued on, a bit spooked. chuck never woke up. when barb described the creature to us, dani and i exchanged glances, but didn't interrupt. but when the story was done, dani told me to go get the book and show her the picture. i flipped the book open to the story of the chupacabras and when i put it in front of her, barb simply pointed to and announced rather plainly, "that's it. that's the thing i saw." barb went on to offer her theory, one i'd heard before but, that it may very well be that sleepy state of mind that makes it possible for us to see things we wouldn't otherwise see. that maybe they're there all around us all the time, invisible to us on this plane, but that our tired minds are able to see past what we're supposed to see. she was tired when she saw her chupacabra. i was tired when i saw that thing float over my jeep. in the winter of 94/95 i was cast in a play at marist college. (a really great play called "noises off" and probably the finest production i've ever had the pleasure to be involved in.) at the time i was living alone way out in the country with my then 2 dogs and 1 rabbit and driving my jeep the thirty miles (each way) back and forth. the play is a really funny farce and required a LOT of physical comedy as well as a lot of rehearsal time to work out the very intricate staging/blocking so we would rehearse some nights 'til 1 or 2 in the morning. no problem for them, they lived on campus. i'm telling you all this 'cause i think it's important to know my frame of mind and that i was particularly tired when all this happened. so anyway, it's about 12:45 this one night. it's february but it's warm, what they call a 'strawberry spring', a kinda winter version of 'indian summer' with an early, false thaw and some really nice weather for about a week. i'm heading home on the pretty much deserted roads and i can remember that the moon was full, making the surrounding woods and farms fairly visible beyond my headlights. and i'm tired. at one point on rt. 9G in the town of east park, the town police have made a small building on a curve their new headquarters and park their cop cars out front at night, a trend that makes many nighttime travellers slow down thinking that the cars are manned and ready to catch them speeding. by that time i was used to it, but because i was so tired that night, it caught me by surprise and i slowed way down, mostly 'cause i was loggy. so coming around this slight curve, i was going slow enough to notice some movement in the muddy field off to my left, a long stretch of ruts and puddles usually put up in corn and/or pumpkins. way off in the north-west corner of the field i saw what looked to me like the canvas tarp off of someone's woodpile rise up off the ground and levitate some 15 feet in the air. not really such an unusual sight; the wind catching hold of someone's not-too-well-tied-down firewood cover and playing the devil with it across an empty field. except there was no wind. and it wasn't a tarp. i stopped the jeep. right there in the middle of the road. i hadn't been going that fast anyway, what with the driverless cop cars slowing me down. what this thing looked like to me as it continued to float a little higher in the air and then float toward me was still a large brownish gray canvas sheet, about 7 feet across the front and about 12 feet long. it looked thicker in the middle, down the length of it and, still keeping the idea that it was a wind-blown tarp, it looked to have a few feet of rope trailing behind it like a...tail. and it undulated as it glided, it's sides continuously rippling, rising and falling, fluttering in the same way that a manta does as it skates across the ocean floor. it slid gracefully beneath some suspended phone/power lines, between the bare trees at the edge of the field, and then it was above me as i twisted my neck and craned my head to watch it pass some six or seven feet above my own canvas topped jeep. i was in awe. no fear, no creepy feeling. just awe. i watched it pass behind me and then into another group of trees and then it was gone. i sat there for a few seconds and then continued on home, knowing that i hadn't been dreaming, but...man, that was weird. the next day, of course, i described the whole thing to my friends and castmates, all of us getting excited and creeped out about what bizarre stuff there is out there. i did a slew of internet searches to see if anyone had seen or heard of anything like what i had seen, but google hadn't been invented yet and my keywords brought up zero results.